← AOI – 10 Years Of Business : Congratulations From Lambton! It is important to know that the adjacent door faces of corner flush bolts will tend to flare open with time. This situation is due to extremely weakened door faces by thinness in this area. 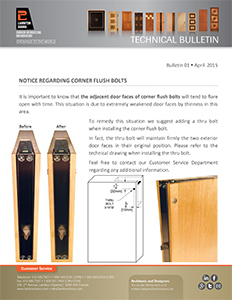 Read more in our Technical Bulletin.